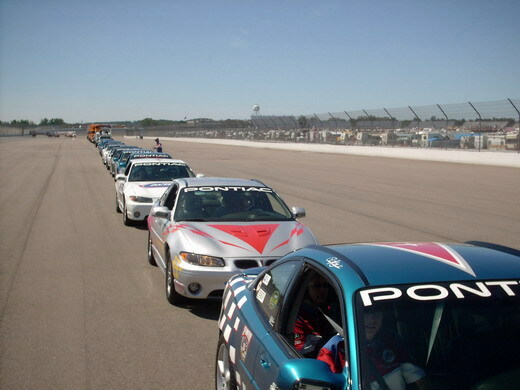 There has been a lot of interest in the Pre Race Laps that the PACE CAR CLUB OF AMERICA takes part in at some NASCAR NEXTEL CUP races. Because of that, I made up this page to answer the questions that people have, and to give them an idea of what these events are like. If you love your car and are a NASCAR fan, I am sure that you would enjoy being a part of these events. I know I had a blast at my first and only event so far, and I really look forward to attending more events. Before I go on, I just want to make it clear that I am not the President of the club. The club President is Paul Cwiklinski, of East Aurora NY. I am just an active member, and you can be too. The main questions I seem to get are "How do I get in to these events?" and "Is my car eligible?". Oh yeah, we can't forget "How much does it cost?". Let me try to answer some of these questions for you. 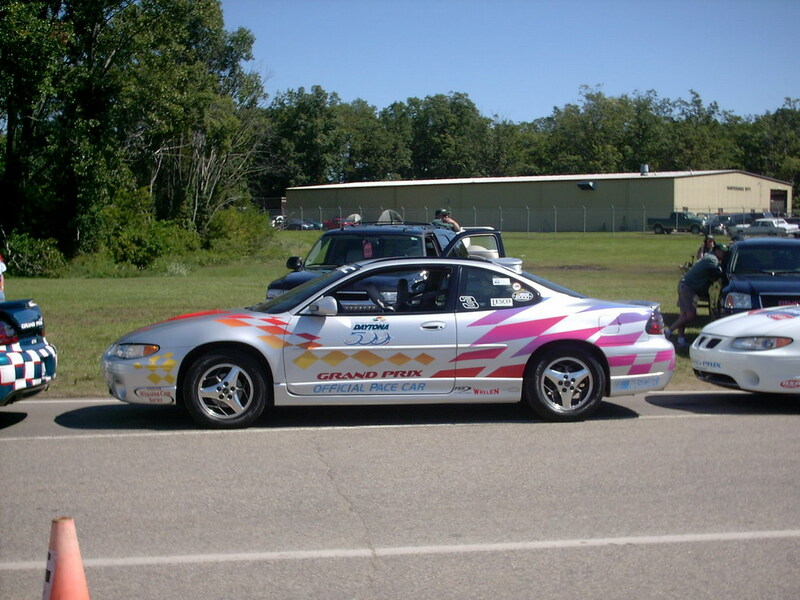 The PACE CAR CLUB OF AMERICA started as a club for owners of the 1998 Pontiac Grand Prix GTP Daytona 500 Pace Car Edition. 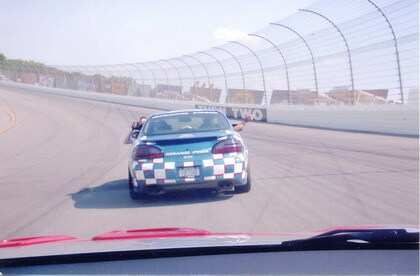 In 2000, they started allowing owners of the 2000 Pontiac Grand Prix GTP Daytona 500 Pace Car Edition cars. 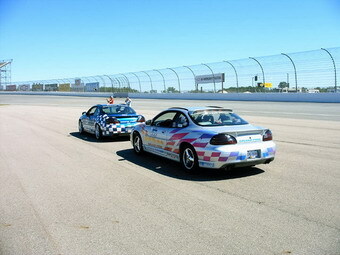 The club has since expanded to include other Pace Cars and commemorative vehicles. Though the club started with a strong Pontiac Heritage, the other makes are just as welcome. I will get more in to which vehicles are eligible near the end of this. Now, before I get in to the "how to join" part of this, let me not so briefly explain what these events are like. I am basing this on the experiences that I had at Michigan International Speedway (MIS) on the weekend of Aug 21-22, 2004. People are driving in from many different areas, and some of them drive in groups. There seems to be a number of people that drive together from the East, such as Pennsylvania and New York. This is not suprising, since the club started in that area. There may be a group forming up in the Midwest as well it looks like. No matter what, though, we are all just one big club. Everyone meets up at a certain point, usually on the Friday night before the Busch race. We meet up, get our rooms, and maybe have a group dinner. This is when we get our credentials and passes. 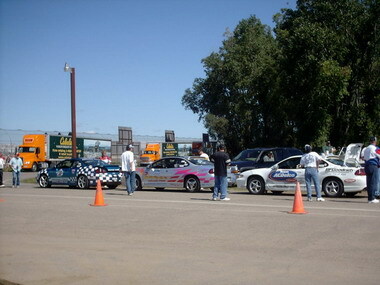 The next morning, everyone drives as a group to the track, and we line up the cars in the display area. It is really neat driving through towns with all of our cars together! Some members may just drive directly to the track to meet up at this time. When we are driving on the tracks property, those of us with strobe systems usually turn them on. After we get the cars set up on display, there may be a grill or two going, and members talk to each other about their cars. There were a total of 16 cars this year. Being a first timer, I learned so much just talking to other people about Pace Cars and NASCAR, and I had my car on display right next to a replica. We had the cars on display along the walkway to the main entrance to the track. As fans walked in, many of them stopped to admire the cars, take pictures, and ask questions. I had many people that wanted to take pictures with my car, and they really appreciated it, as I let many of them sit in the car for their photo. One family was really impressed because we did not charge a fee to take a photo "like Santa does at the mall". You do not have to let people sit in your car, I just did because I thought it was good PR for the club. We also sold NASCAR RACE DAY VICTORY JUNCTION pins, which raised money for that charity. I actually learned some things about my car, and heard from people that said they had pictures of it at home. I also found out there is a nice over 1/2 page photo of my exact car on page 71 of the 2001 Daytona 500 Program! (Of course, I bought a few copies on ebay the very next week! People will be saving that program forever.) Amongst our group of members, I found that many of them had a lot of knowledge about Car Care, Graphics, GM, Racing, and NASCAR. I also met a few people that had replicas of my car. That was neat. These pictures show the cars on display along the walkway into the main entrance area of the racetrack. This area would soon be to crowded to get really good pictures. Since we had pit passes, some of us went out to the pits to look around. It was my first NASCAR Race since I was a kid, so this was something I really wanted to see. Then we took time for checking out the vendors, and just walking around taking in the spectacle that is NASCAR. At all times, there were some club members around the cars to keep an eye on them, so I felt safe with it in the display area. We all met up at a certain time to get ready for the Pre-Race lap that we were schedule to run. This was probably an hour and a half or so before race time. We all get in our cars, and line up in our order. I guess the rule of thumb on lining up for the lap is cars that have strobe systems go first, and other cars behind. This just gives a cool effect for the fans as we go around the track. During our lap, we gave rides to people with the Cystic Fibrosis Foundation, and Hot Wheels Corporation. 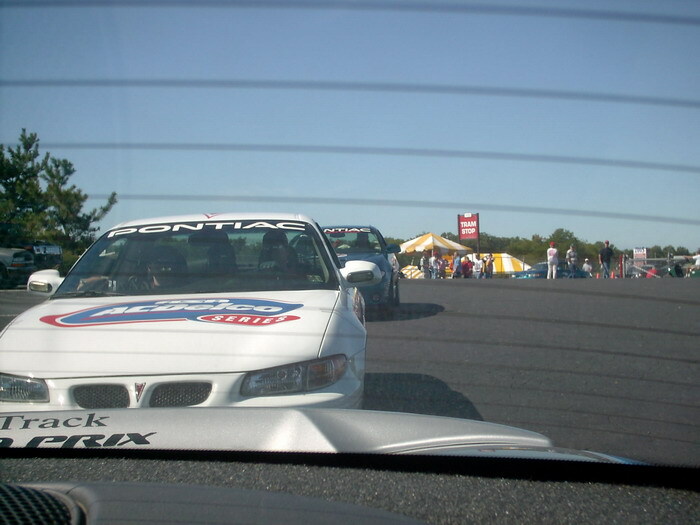 Here we are preparing to go out on the track, lining up in the staging area along the backstretch, and doing the lap. My car is the silver Grand Prix with the "Pontiac Racing" graphics set. These graphics are all original as they came from Daytona International Speedway. The car still has the 2001 Daytona 500 logos on the doors and the date of February 18, 2001. NASCAR fans will always remember that day as the day Dale Earnhardt Sr was lost at Daytona. The full history of my particular car can be seen by clicking the home button below. After we completed our lap, we pulled off, and took some group photos of the members and their cars by the backside of the track. We then all hopped in our cars, and paraded them around to our parking area, where we had an area reserved to park our cars during the race. People would cheer for us as we drove by. We went to our seats in the stands, and it was cool for me because I had not been to a NASCAR race since I was about 8 years old. So the races were pretty exciting for me. After the Saturday Busch race, we all drove to our hotel, and later met for a club dinner at an Olive Garden Restaurant. This was a great chance to talk to other club members without the distractions of the track. There were some small door prizes, and it was an enjoyable time. A few people did not make the dinner, and decided to attend a concert at the track that night. Everybody got along great. I even plan on bringing my 6 year old next year, as families are welcome! 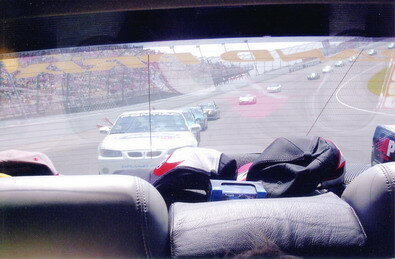 The next day (Sunday) was pretty much the same, with a bigger crowd for the NEXTEL CUP Race. More people, and more fun. I left after the race on Sunday because of a tight work schedule, however, many club members stayed, and took a tour of some locations in Dearborn, Michigan. The extra day is scheduled in just in case the race is postponed a day due to weather. Fortunately, this did not happen! So, How much did this all cost? Well, not much. Less than I would have spent if I had just gone to the races without the club. I had my annual club dues paid up ($50.00 per year... includes insurance for club events, decals, newletters, etc.). For the Michigan Race, I paid for my $70.00 NEXTEL CUP TICKET, but with that I received my Pit Passes for both days, and the ticket to the Busch Race the day before (about $120.00 worth of passes for the $70.00 ticket). I had to pay a $25.00 registration fee to get my car on the track, and that was it for the race (The club pays for an insurance policy that allows us to go on the track, so we are getting by cheap with just a $25.00 registration fee). I had to pay for my hotel room, which I split with the three other people that came with me (they paid $70.00 each for their tickets also). And I paid for my food and gas, which I would have had to pay for anyway going to a race. Bottom line on expenses, $25.00 for car registration, then $70.00 for each ticket, plus food and hotel. (Figure on 2 nights hotel, and the rooms are about $120.00 a night. If you split it with others though, its cheap! >>> PLUS... The sponsor money may cover part of the hotel costs this year!) Anyway, the expenses are pretty much the normal expenses you would incur just going to the race. Then you get all the extras thrown in, like Pit Passes, Busch tickets, free (and hassle-free!) parking, etc. Not to mention all of the cool things that you get to do while you are there, and the items that were given out for us. And you get to help charities a little. I imagine other races may be a little different, but this is the way it was at Michigan so you have a little idea of what to expect. The President of the club, Paul Cwiklinski, shells out the money for these tickets AHEAD of time, so he does ask for a deposit ahead of time. 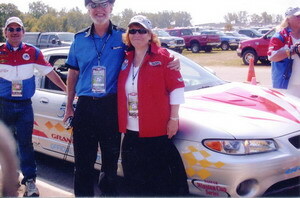 For the 2005 Michigan race, he is asking for a $175.00 deposit towards the hotel and tickets. I consider this fair, otherwise he would have thousands of dollars of his own money out on tickets ($70.00 per person times 2 or 3 per car, times 16-20 cars, it could easily be $4,000 or more, plus $25.00 per car registration)... I am sure if something came up at the last minute, and you could not attend the event, someone else would be able to buy your tickets. 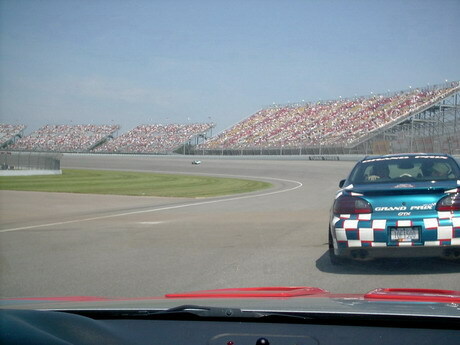 At MIS in 2004, someone dropped out a few days before the race due to a family emergency, and someone in the club bought the tickets for friends to go with (me). So I would not hesitate to send a deposit. This club has an established relationship with ISC, and has been doing these events since the 1998 Daytona 500 Pace Car Replicas came out, so it is a group you can have faith in. Now, this was my first event with the club, and I am sure every event is a little different. Some of the club members are regulars that attend nearly all events. I am sure some people only make select events that are in their part of the country. I know that for the 2005 season, the club will be doing the Michigan race again, and is looking at the Brickyard 400, and a couple of races at Lowes Motor Speedway in Charlotte. They also do some non-race events, including parades, and a club outing at Watkins Glen. I will definitely go to the Michigan and Brickyard races next year. Charlotte may be a little far away, but I will try to make at least one of the Charlotte races. Having two young kids (and another on the way), and a full time job with a screwed up schedule, I feel lucky to get to the races I do get to. Heck, I feel lucky just to HAVE MY CAR, let alone traveling around the country with it! LET'S GET A PACE CAR CONVOY GOING TO THESE EVENTS!!! As far as what kinds of cars were at the Michigan Race with the club... 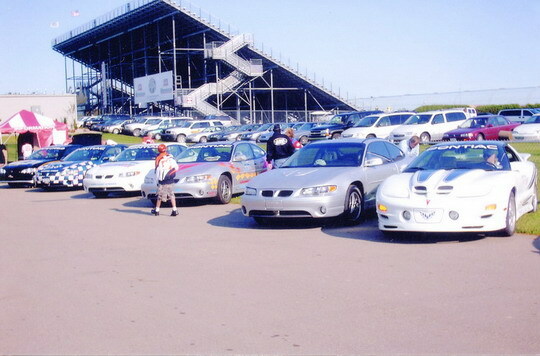 There were about nine 1998 Grand Prix Daytona 500 Pace Car Editions (the club started with these cars), a white 2000 Grand Prix ASA Retired Pace Car, my 2000 Daytona 500 Retired Pace Car (one of 2), a 2000 Daytona 500 Pace Car replica (one of 2000), an 02 Dale Earnhardt INTIMIDATOR Monte Carlo (one of 3333), a white Anniversary Edition Trans Am, a black Monte Carlo Brickyard Edition Pace Car (one of 100), and a silver Camaro Convertible Parade Car used as a "Driver Introduction" car for Jeremy Mayfield in the Brickyard 400 (one of 43). We would love to hear from intersted owners of any of the NASCAR themed Monte Carlos, such as the Dale Jr., Intimidator, Jeff Gordon, Tony Stewart cars, and the ONE Michael Waltrip LEGACY Car (yes there is one, I have chatted to the girl that owns it!). All of the Pace Car Edition and BRICKYARD PACE CAR Monte Carlos are welcome, as well as any retired NASCAR Pace Cars, or Grand Prix Daytona 500 Pace Car Edition Cars. The Trans Am Anniversary and Collector Edition cars are eligible, as these were used as pace cars at Daytona many times. Parade and Driver Introduction cars are welcome as well. If you have any questions about eligibility, feel free to call Paul Cwiklinski at the number below. He will be happy to talk to you. 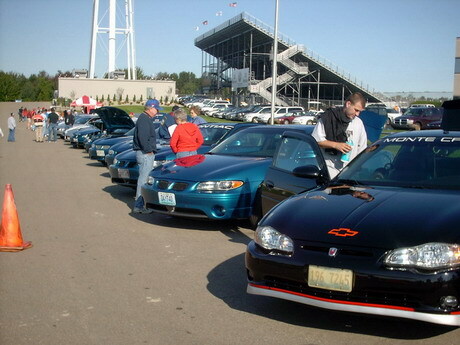 The club allows Associate Members also, so if you do not have a car to take on the track, we will get you a ride. Be sure to get a hold of him before you send in your dues, just to make sure your car is eligible. And tell him George from Chicago sent you! I would really love to see more Retired Pace Cars join, as well as some Inaugural Brickyard Pace Cars. Also some older Trans Am Pace Cars would be cool. I only mention these because they are my personal favorites, but others have favorites too!